In my world, the two key factors that weigh the heaviest when it comes to cooking, are simplicity and nutritional density. Notice how I put simplicity first? After spending three (fun-filled!) weeks on the east coast being over-tired, under-prepared, and swollen from eating one too many bagels, cookies, pasta dishes, glasses of wine, etc… I was ready to get back to my routine and lighten things up a bit. For starters, I always forget that you can roast shrimp. I don’t know why, it’s just one of those things I learned later in my ‘cooking’ life that doesn’t seem to stick in my brain. 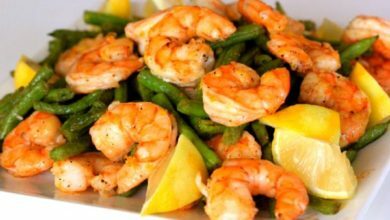 And what could be easier than adding a few dried seasonings to some green beans and shrimp and tossing it all in the oven for a quick roast? For me, roasting sings winter. But since it’s been like 70 and sunny in LA lately this dish was a perfect way to marry lighter ingredients with a cozy-cooking-technique. I pretty much used Kalyn’s recipe verbatim, but this is one of those dishes you could take a million different ways just by changing up your seasonings. Serve this over some quinoa or brown rice and you’ve got your self a super-quick, super-easy, clean & delish meal! Monterey Seafood Watch (great resource to check for sustainable seafood). To watch the step-by-step video guide for this recipe, CLICK HERE. Once the shrimp has been peeled and cleaned, rinse it under cold water. Be sure to pat the shrimp really dry (if the shrimp is not dry it will steam rather than roast!). Place the trimmed and cut beans in a bowl and toss with extra virgin olive oil, ground coriander, ground cumin, salt, freshly ground black pepper, and Cayenne pepper. Place shrimp in another bowl with the extra virgin olive oil, lemon zest, salt, and fresh ground black pepper. Brush roasting pan with olive oil or use a non-stick spray, then arrange beans on pan in a single layer (as much as possible). Roast beans 10 minutes. 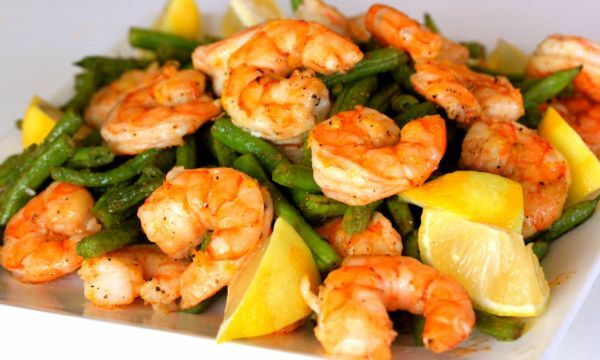 After 10 minutes, toss the beans and arrange shrimp on top and roast 8-10 minutes more or until shrimp are just done. Squeeze the four lemon quarters over the shrimp and beans and serve immediately.